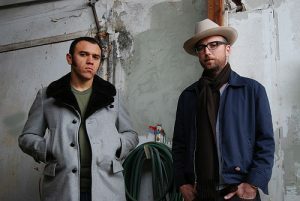 The Greyhounds guitarist Andrew Trube and keyboardist Anthony Farrell have been making music and touring for 15 years while refining and developing a sound Trube describes as “Hall and Oates meet ZZ Top.” The band also has strong ties to Memphis — the home of the soul music that inspires them. During their long musical partnership, Trube and Farrell have written songs for, among others, Derek Trucks and Susan Tedeschi, toured with American Idol winner Taylor Hicks, and for several years worked together as part of JJ Grey and Mofro, playing 200 dates a year. In 2013, Memphis-based Ardent Music signed The Greyhounds to a three-album deal. The independent record label based out of legendary Ardent Studios expects to build on the fan base the band has developed both on the road and as a staple of the Austin music scene. The Greyhounds last played in Portland at the Waterfront Blues Festival this past July and certainly aren’t strangers to the area. They will once again be returning for a night at the White Eagle Saloon, 836 N Russell Street. Show time is 7:30 pm and tickets can be purchased in advance through Cascadetickets.com or at the door, both priced at $10.00. 21 & over only.